5/9/17 Hell and High Water with Meria and Chuck Ochelli. Hanford plutonium finishing plant tunnel collapses -real and present nuclear danger; back to Yucca Mountain with trump? “Last Man on Earth”; Fukushima is everywhere, the Oceans;trump and de-regulations;trump a front man;Ivanka/Jared/China/handlers;did we say we’d prefer Hillary? Bush Jr. looking good; the Ethics committee – where are they? Russia-Gate; Michael Flynn-blaming Obama? Racist,sexist trump administration; Goldman Sachs government; what to do? Vote with your dollars and forks, get your money out of Wall st & Big Banks; be a conscious shopper; suicidal stupidity; death panels;The Matrix; “Bananas” by Woody Allen;robots made in Japan;religion and politics-control masters and much more. 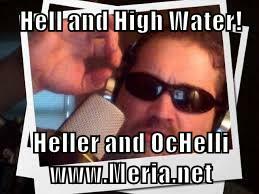 12 Responses to "Hell and High Water with Meria and Chuck Ochelli"
they better get busy quick! believe that garbage, refusing to educate themselves. I have been following his work for a while, another gem among us. Best to you. love you guys together good show. Here is a fact. Your government is a fraud, its corrupt, all its institutions are now run by corporations for proffit. No one has a single chance to survive as long as you keep thinking and voting for all that corruption. they are killing you off now, the land is poisoned, the water is poisoned, the livestock is poisoned, the ocean is poisoned, and with all the cell towers and wifi you are all becoming steril and being experimented on at a dna lv daily. As long as people are divided, arguing about this or that, believing in this or that and doing thier own thing unfortunately that also means there will be no united front to destroy that which is the root cause of all your problems. David Icke has always exposed the truth and investigated the web of coruption, his goal is to expose it for what it is. He lets people make up their own minds. to stop it, not by phisical violence but with truth and clarity of thought. or slowly die off and get collected in the Anunnaki soul recycling machine untill this entire reality ends. I have heard that Dane Wiginton is not solution based at all and has blocked those who do speak about solutions to chemtrails, i.e. trailbusting, from distributing material at his conferences. I’ve heard similar. I just get his newsletter. I went along with this show, listening intently, nodding my head, smiling, “getting it.” AND THEN, you said something about Matthew, Mark, Luke, and John not being “real” names from biblical times. WHAT? I never, EVER thought of that. Now, all I can DO is run that little factoid through my head. You and your guests never fail to spark my old brain with new ideas that had never occurred to me before. YAY!! something to think about indeed!